Sable Paint Brush. Size 00. Sable Paint Brush. Size 000. 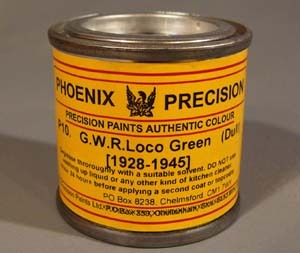 LNER Garter Blue enamel paint. Dull (Eggshell) Finish. 15ml Tinlet. LNER Coach Teak. Gives painted finish as opposed to grained teak finish. (For this see P995/P996/P997). Satin finish 15ml Tinlet. 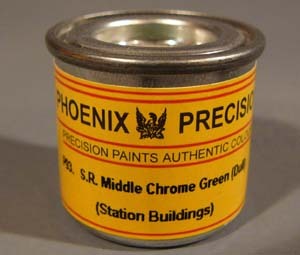 SR Middle Chrome Green enamel paint (Buildings). Dull (Eggshell) Finish. 50ml Tin. SR Buildings Cream enamel paint. Dull (Eggshell) Finish. 50ml Tin. BR loco Green Pre-1954. Enamel Paint. Dull (Satin/Eggshell) Finish. 50ml Tin. BR Yellow - Green (Skirts of early diesels such as Deltics). Satin Finish. 15ml Tinlet. LBSCR Marsh Umber Loco and Coach. Satin/Dull Finish. 50ml Tin. LBSCR Marsh Loco Lining Brown (Outer panels surrounding Umber). Satin Finish. 15ml Tinlet. NER loco Green. Satin Finish. 15ml Tinlet. SECR Wagon Grey. Matt Finish. 15ml Tinlet. Bleached Tarmac (Faded). Matt Finish. 50ml Tin. Mahogany. Satin Finish. 15ml Tinlet. Etch Primer Thinners 125ml Tin. General Purpose Thinners 125ml Tin. New Post Office regulations prevent us from dispatching this product by post. Now available for exhibition sales only. Phone or email to pre-order. Please allow 7 days notice. General Purpose Thinners 250ml Tin. New Post Office regulations prevent us from dispatching this product by post. Now available for exhibition sales only. Phone or email to pre-order. Please allow 7 days notice. Spray Painting Thinners 125ml Tin. Now available for exhibition sales only. New Post Office regulations prevent us from dispatching this product by post. Phone or email to pre-order. Please allow 7 days notice. Quick Air Drying Thinners for Airbrushing 250ml Tin. New Post Office regulations prevent us from dispatching this product by post. Now available for exhibition sales only. Phone or email to pre-order. Please allow 7 days notice. Varnish Thinners 125ml Can. New Post Office regulations prevent us from dispatching this product by post. Now available for exhibition sales only. Phone or email to pre-order. Please allow 7 days notice. Surface Cleaner for Metal Not suitable for plastics 125ml Can. New Post Office regulations prevent us from dispatching this product by post. Now available for exhibition sales only. Phone or email to pre-order. Please allow 7 days notice. Surface Cleaner for Metal Not suitable for Plastics 250ml Can. New Post Office regulations prevent us from dispatching this product by post. Now available for exhibition sales only. Phone or email to pre-order. Please allow 7 days notice. SuperStrip Paint Stripper. Safe on plastics. 250ml Bottle. New Post Office regulations prevent us from dispatching this product by post. Now available for exhibition sales only. Phone or email to pre-order. Please allow 7 days notice. SuperStrip Paint Stripper for Plastic. 125ml Bottle. New Post Office regulations prevent us from dispatching this product by post. Now available for exhibition sales only. Phone or email to pre-order. Please allow 7 days notice. Buff Two Part Etching Primer/Filler. 250ml when mixed. New Post Office regulations prevent us from dispatching this product by post. Now available fro exhibition sales only. Phone or email to pre-order. Please allow 7 days notice. Isopropanol 125ml Bottle. New Post Office regulations prevent us dispatching this product by post. Now available for exhibition sales only. Phone or email to pre-order. Please allow 7 days notice. Black Two Part Self Etch Primer. Total 250ml when mixed. New Post Office regulations prevent us from dispatching this product by post. Now available for exhibition sales only. Phone or email to pre-order. Please allow 7 days notice. Black, Two Part Etching Primer. Mix 50/50 as required 60ml pack. New Post Office regulations prevent us from dispatching this product by post. Available for exhibition sales only. Phone or email to pre-order. Please allow 7 days notice. Grey, Two Part Etching Primer. Mix 50/50 as required 250ml pack. New Post Office regulations prevent us from dispatching this product by post. Now available for exhibition sales only. Phone or email to pre-order. Please allow 7 days notice. Grey, Two Part Etching Primer. Mix 50/50 as required 60ml pack. New Post Office regulations prevent us dispatching this product by post. Now available for exhibition sales only. Phone or email to pre-order. Please allow 7 days notice.